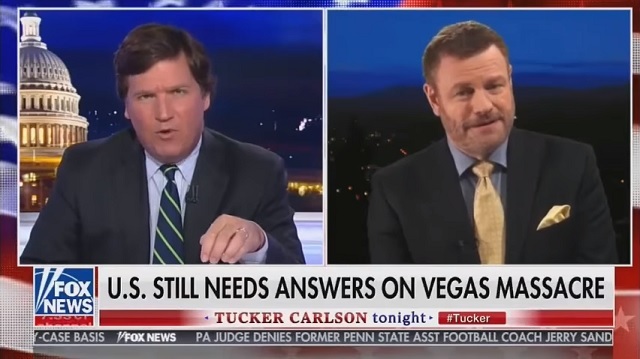 Wednesday night on Fox News, Tucker Carlson questioned why Las Vegas security guard Jesus Campos gave his one and only interview to Ellen DeGeneres, who is heavily sponsored by MGM. After playing a clip of Ellen's bizarre interview, Tucker said, "Is that really an interview?" "Well, it turns out it could actually be a bizarre case of cross marketing by MGM Resorts that owns Mandalay Bay, sponsors by the way The Ellen DeGeneres Show, and features Ellen themed slot machines in many casinos including Mandalay Bay," Tucker said. Tucker went on to interview Mark Steyn, who said he's not a "conspiracy nut" but "you're entitled to be one on this." "Because, whether by intention or design, nothing is proceeding normally in this case up to the absurdity where someone says, 'I'm only going to give one interview and I'm gonna give it to Ellen DeGeneres,'" Steyn said. Steyn noted how the timeline changed repeatedly and not a single photograph was released of Paddock by authorities despite Las Vegas being one of the most heavily surveilled cities in the world. "There's dishonesty in here somewhere, I don't know what it adds up to," Tucker said. "As I was walking down, I heard rapid fire. And at first, I took cover. I felt a burning sensation. I went to lift my pantleg up and I saw the blood. That's when I called it in on my radio that shots have been fired, and I was going to say that I was hit. But I, uh, got on over my cellphone, just to clear that radio traffic for [sic] they can coordinate the rest of the call," a stammering Campos said.